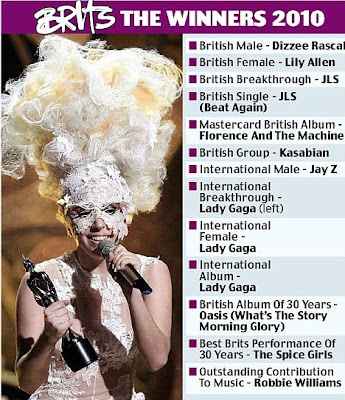 What a night the BRITS were! Broadcast live on ITV, we all knew there was going to be some kind of drama, drunkard outburst and dodgy wardrobe malfunctions on the night. Douchebag of the night went to Liam Gallagher. 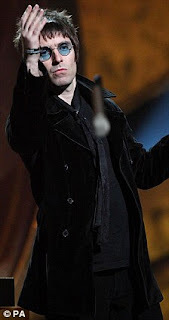 When accepting his award for "Best Album of 30 years" he told the crowd, "Let's go and take Class A drugs"....and then threw the mircrophone into the stage. Right...ok Liam! Thankfully host of the night, Peter Kay, was there to save the day describing him as, "What a knobhead" as soon as he left the stage! :-) When Liam found out, he did what any man who has been insulted with do, he took it to the streets of...Twitter...yep - he took it there..be scared Peter Kay! But it was Lady Gaga stole the show, winning THREE awards! 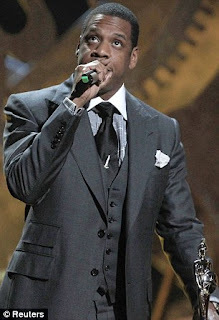 The triple winner dedicated one of her awards to the late Alexander McQueen. JLS were other big winners of the night, winning two awards for Best British Single and Best British Breakthrough Artist. Other winners of the night were JayZ, Florence & The Machine, Dizzee Rascal, Robbie Williams, Spice Girls and more (see full list of winners below). Cheryl Cole performing...worst performance of the night..but i'll let her off seeing as she has a lot on her plate..
Katie Price Marries Alex in Las Vegas Wedding!